Pictured above you will see an iron entry door we recently installed in Atherton, CA. This arched Iron door perfectly compliments the clean look of the front of this home and creates a dramatic first impression for guest and on lookers. 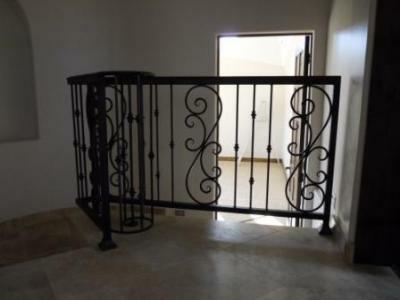 Once you enter this home you can see that beautiful custom iron railing is strategically placed around this home adding a touch of elegance every where you look. Your entry door is the first thing your guests and yourself see when arriving at your home. When you live in such a prestigious community such as Atherton there are impressive homes and beautiful gardens everywhere you look. Your home represents you and you deserve to be proud of it. 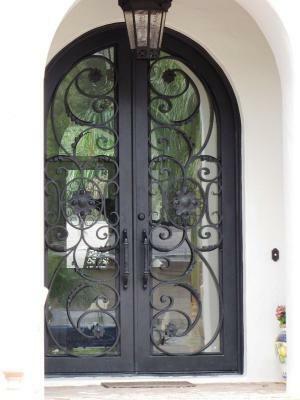 Signature Iron Doors creates beautiful custom and unique designs for each of our customers. Our scroll work is hand forged and our one of a kind iron doors are durable and long lasting that requires very little maintenance. Take a moment to visit our website and contact us to see how we can help you with any of your iron needs and to allow us to help you to see your homes full potential.